One of the most popular gaming genres for our smartphones is the endless jumper game type. In these games you are asked to move up and attempt to survive as long as possible. This offers a great way to play on the go because you can pick the game up and play for just a couple of minutes and still have a great time. 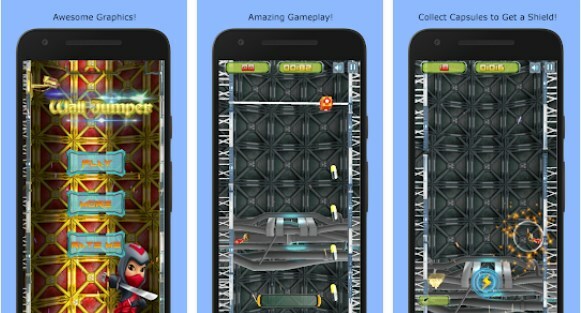 To help you with your search for the most interesting endless jumper game, we searched and discovered a super addictive jumping game. Let’s see what the game offers you. What is this ninja game about? This is one highly addictive and entertaining ninja jumping game that is easy to play and fun for all players that like to play fast paced action games with exciting jumping gameplay. This endless jumping game is developed on android platform, offering its users sharp and quality graphics that will keep their attention each time they play. Players will have fun playing as a ninja and jumping up while trying to escape the nuclear factory. Testing the skills of the player with many obstacles on the way out, this game pushes the players to act fast and precise, avoiding the dangerous obstacles and get out. Wall Jumper with its exciting and challenging ninja jump gameplay offers users endless fun and adventure packed in one highly fun jumping game. On this tap game, players are asked to tap the screen in order to jump high. On the way up and out the factory, players will need to avoid many dangerous obstacles on their way by getting around them. When the player hits an obstacle, the game will end. With jumping high as possible players will get their chance to win high scores and get closer to their way out the nuclear factory. The game is also offering the players to collect capsules on their way up and use them in order to obtain their powerful shield to protect them along the way. More than that, the game offers many power ups too for multiplying the player’s scores. Endless fun of endless jumping, offering players to enjoy each time they jump and play as a ninja. Download this game for free now on Google Play and tap to jump high and escape the factory!